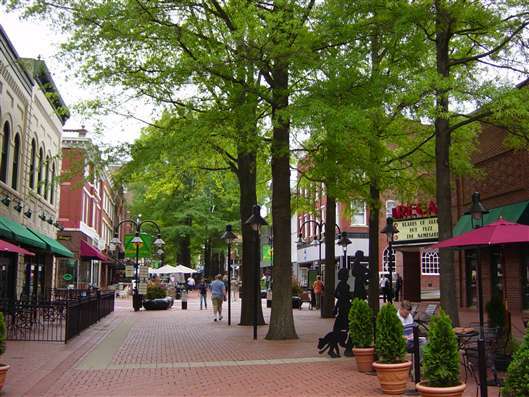 Where the Sidewalk Starts: Pedestrian Mall: Friend or Foe? The idea seemed solid. Give multiple downtown blocks over to pedestrians and, in the process, take on the new suburban malls with a compelling destination to draw crowds back downtown. Only, in most cases, it didn’t really work out that way. I agree that all-or-nothing approaches rarely work, but I don't believe the problem with pedestrian malls is eliminating vehicles per se. As this study from earlier in the year explains, walkable centers generally don't have a sufficient market within their pedestrian shed (the distance people will walk to get to the center) to support their businesses. Instead, they need to "import" customers from surrounding locations via transit, biking, or driving--modes that accommodate longer trips. A sustainable pedestrian mall will allow for these trips, even if it doesn't direct them straight through its core.